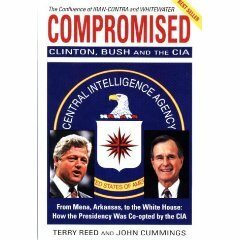 Compromised: Clinton, Bush and the CIA by Terry Reed, John Cummings. a book by Terry Reed, John Cummings. The definitive book on Mena, Reed's first person account of his CIA service on behalf of the Contras opens eyes as to the relationships between the CIA, drug trafficking and recent occupants of the White House. A second edition is in bookstores, however not from bankrupt S.P.I. Books. Compromised is the true story of Bill Clinton’s political sell-out to the CIA. Clinton’s unbridled political ambitions and his campaign pledge to create "jobs for Arkansans" led him to compromise his ideals in exchange for CIA support in his bid for the Presidency. He permitted the "Agency" to use Arkansas factories to make untraceable weapons and he allowed CIA contract agents to train Contra pilots on rural airstrips in support of the war in Nicaragua – effectively evading the Congressional ban on military aid to the Contras. This expose unfolds through the eyewitness account of Terry Reed, a former CIA asset whose patriotism transformed him into a liability when he refused to turn a blind eye to the Agency’s drug trafficking. While helping the CIA set up its secret "black" operations, he unwittingly compromised his family’s safety, ultimately forcing them to become fugitives. Realizing that Reed witnessed the making of a counterfeit President and knew too much about its drug operations, the Agency set out to destroy him and his family. This Arkansas-CIA connection became Clinton’s darkest secret – a secret he shared by then Vice-President Bush, who himself was compromised by his involvement in the Iran-Contra scandal. Their shared guilt kept them silent and tied their hands as they faced off in the 1992 Presidential election with neither mentioning Iran-Contra. The Justice Departments of Reagan, Bush – and now Clinton – have orchestrated an ongoing cover-up of the Arkansas-CIA connection, which has gone undetected for eight years with Bill Clinton its major beneficiary. Clinton's reward for this Faustian pact? The White House. Reed puts Clinton directly in the "Iran-Contra loop". Both attended a secret meeting where CIA arms arrangements, illegal Contra training and money laundering were discussed. Involved with Clinton in this cabal were Colonel Oliver North, William Barr (George Bush’s attorney general), Felix Rodriguez (Bay of Pigs veteran and George Bush’s CIA contact) and CIA contract agent Barry Seal, who used the cover of a high-profile drug trafficker to carry out his missions. "Compromised" reveals the details and names of all who were involved, including these faceless power brokers now in positions of public prominence in Washington, D.C. When the CIA learned Reed had more patriotism than they bargained for, forces within President Bush’s Justice Department, the CIA and the State of Arkansas decided he had to be neutralized. People close to Clinton conspired to set Reed up on false federal criminal charges, forcing him and his family into hiding. But Reed was acquitted, and now wages a one-man legal war to bring those who framed him to justice. Found innocent by a court of law, Reed was then convicted by TIME Magazine, which aligned itself with a Clinton campaign consumed with protecting its candidate from scandals. Why did Terry Reed, who performed intelligence services for the US Air Force, FBI, and CIA, come forward with these revelations now? – to set the record straight and to clear his name. "Compromised" reveals one of the most clandestine operations in recent U.S. history. It also offers behind-the-scenes insights into the sordid world of intelligence, where things are seldom what they seem and powerful people disguise greed and ambition behind the convenient mask of national security. Terry Reed is a former Air Force Intelligence operative who served with the most secret project of the Vietnam War. Task Force Alpha. This was the most sophisticated and highly classified intelligence gathering unit of that period. At the age of 21, armed with a top-secret security clearance provided by the Defense Intelligence Agency, a near photographic memory and strong mid western values, he was entrusted with America’s dirtiest secrets. As a civilian intelligence asset, he later worked for the FBI and CIA on projects the law had bared these agencies from undertaking. His problems began when the CIA found he had more patriotism than it had bargained for. John Cummings is a former prize-winning investigative reporter at N.Y Newsday. He has co-authored the "Heist" (1987), "Goombata: The Improbable Rise and Fall of John Gotti and His Gang" (1990) and "Death Do Us Part" (1993). For over thirty years, since the Bay of Pigs, he has studied the confluence of intelligence gathering, money laundering and drug trafficking. He resides in New York.